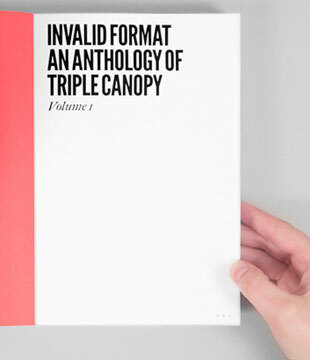 On January 19, at McNally Jackson Books in New York, Triple Canopy’s Alexander Provan and Peter J. Russo read selections from Invalid Format: An Anthology of Triple Canopy and discussed its genesis and form with the book’s designer, Prem Krishnamurthy, and Adam Michaels, both of the firm Project Projects. (They were joined by other, interjecting editors in the audience.) Krishnamurthy and Michaels talked about how Project Projects makes productive use of the tension between new and old print technologies and design conventions in its work, which ranges from exhibitions to pamphlets, websites to catalogues. Michaels spoke of historical precedents for Invalid Format and his recent volume, The Electric Information Age Book: McLuhan/Agel/Fiore and the Experimental Paperback, a collaboration with Harvard cultural historian Jeffrey Schnapp.